It has been more than a month since I’ve posted to this blog. So first, a word of apology to those faithful readers who click on to this page each week hoping to read a fresh update on a regular basis. Several people have contacted the office wondering if there is something wrong with the link. No, all is well. It’s just that October has been a somewhat demanding month with travel and a seemingly endless amount of meetings. The hectic pace makes it difficult to write consistently on this page. I’m still writing – sermons, letters, newsletter articles, memos, reports – just not here. I’ll try not to make a habit of apologizing each time I take an extended absence, but I ask you to understand. That being said, it seems there’s no better time to ask forgiveness and return to writing than on the observance of Reformation. For those readers who aren’t Lutheran, you may be wondering what in the world is Reformation? For those who may be a bit more familiar with what I’m talking about, you may still be puzzled as to what it is that Lutherans find so special about this day? What is it that we commemorate every fourth Sunday in October? For starters, we remember an event. Legend has it that 498 years ago, on October 31, 1517, Martin Luther—a Roman Catholic monk—walked up to the door of the castle church at Wittenberg, Germany and nailed on it a document titled, “Disputation on the Power and Efficacy of Indulgences,” also known as the ninety-five theses. I say legend because in recent years the account of this event has been called into question. But that is another story for another time. These theses, or propositions, condemned “indulgences,” the practice of selling of pardons by the Catholic Church. Luther invited anyone to debate these points. No one did. But something even greater happened, something Luther could not have imagined beyond his wildest dreams. 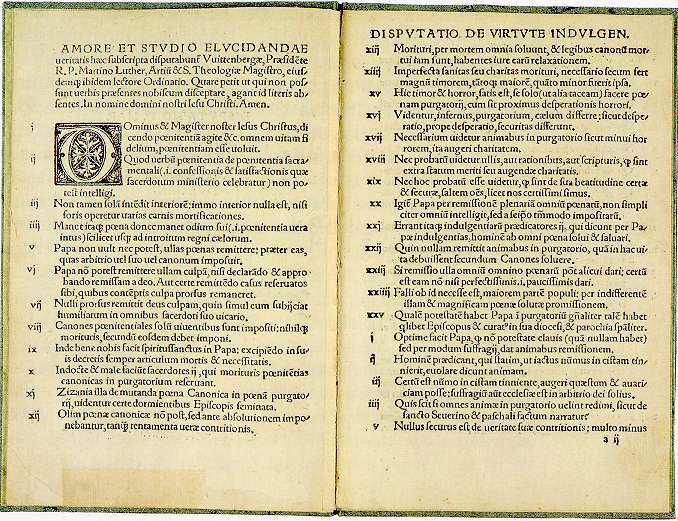 This document was copied, translated, and spread throughout Europe—and from this simple act, this invitation to discussion, what we now know as the Reformation was born. The Reformation initiated a change, a new way of looking at faith—a re-formation. The Church of Rome taught that salvation was through the sacraments, good works, and indulgences. An indulgence was forgiveness that could be bought from the Church. Now let me quickly add that things have changed. The Church of Rome has itself re-formed down through the years to the point that in 1999, an historic document was signed between the Vatican and the Lutheran World Federation called the Joint Declaration on the Doctrine of Justification. In this document the two church bodies, while not totally erasing the division that exists between them, have at least agreed to a common understanding on this issue of salvation by grace alone. The changes that have taken place in the Roman church since the Second Vatican Council of 1963 have swept away a lot of those other issues that I mentioned earlier. In Northeastern Ohio, we have gone even a step further and signed a covenant with both the Diocese of Youngstown and the Diocese of Cleveland. In those covenants, we are committed to pray together, study together and act together on social issues that affect all God’s people. And even more recently, that covenant was lived out yet more fully when St. Paul’s Lutheran Church in Massillon opened its doors to St. Mary’s Catholic Church, across the street from St. Paul’s, when its building was damaged by fire. [Read article here]. 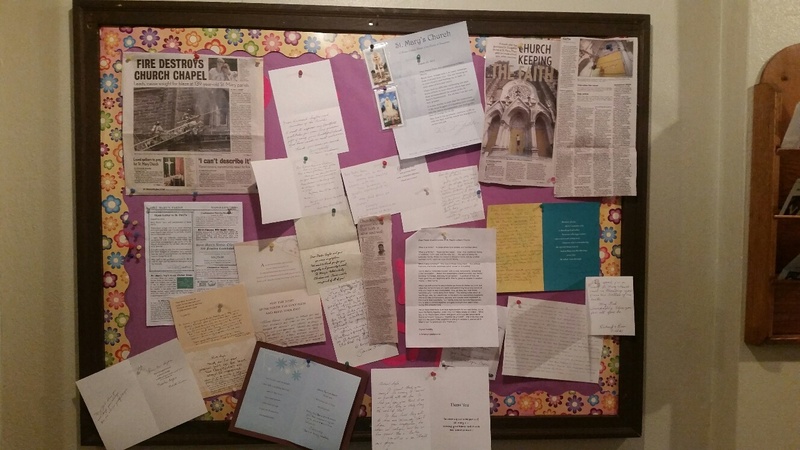 I can’t tell you how delighted I was to see and read some of the many letters of thanks from St. Mary’s parishioners that filled the bulletin board at St. Paul’s. It fills me with hope that our two denominations, long filled with enmity for each other, are finally realizing the grace that God promises through faith in Jesus Christ. If our faith is to remain alive in us, it must constantly be lived out in a state of reformation and renewal. We are always in need of that re-formation, not only on a religious level but an individual level as well. Like the church, so many of us are weighted down by the problems, mistakes and hurts of yesterday. Many of us live with guilt over something we wish we’d never said or something we wish we had never done. Others live with resentment and bitterness because of an injustice that was done to us. Wouldn’t it be wonderful if there was a way to get rid of the weight of unresolved guilt which weighs us down? Keeping resentment and bitterness under the surface of our life is like trying to keep a clenched fist to hold on to something we refuse to let go. Soon it takes all our energy just to keep it closed. Eventually, it begins to hurt. After a longer while it grows numb. But if we open it up and let go whatever it was we were holding onto it gives us a sense of relief. Much of my time in the past few weeks has been spent mediating conflicts among congregations. It is physically and emotionally draining. At some point it just wears one out. But I hold fast to God’s promise of grace and forgiveness. The power of forgiveness has the potential to change our lives. God has erased the record of our past wrongs. God has forgotten our past sins and mistakes. Why, then, should we remember them? Why should we allow the pain of our past to define our future? On this remembrance of the Reformation, may we also remember that we serve a God of grace, who forgives our iniquities and remembers our sins no more [see Jeremiah 31].